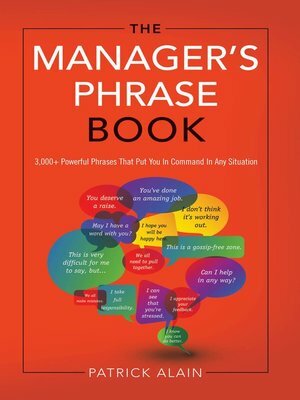 The Manager's Phrase Book is a collection of thousands of ready-to-use phrases that will enable you to move into the ranks of today's most competent managers. You will have control of any situation at a moment's notice, regardless of your position in the corporate world. You will have all the weapons you need to succeed where vibrant, meaningful, appropriate, and, perhaps above all, precise language is required. The Manager's Phrase Book makes it easy for you to break out of the mundane world of management and to take on all comers. It is the latest compilation of Patrick Alain's research on how managers really communicate in today's world.